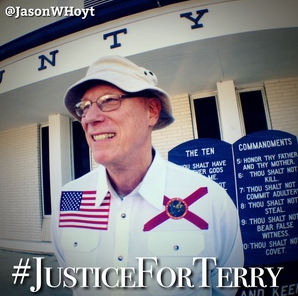 JASON HOYT HAS FOLLOWED THE TERRY TRUSSEL CASE FROM DAY ONE! Jason W. Hoyt is an author, speaker, radio-show host, blogger, media guest, commentator and has been referred to as a motivator, strategist and thought-leader working to ensure his audience, readers, listeners and fellow patriots focus on God, the Constitution and the Proper Role of Government. NOVEMBER 6, 2014 DIXIE COUNTY BOARD OF COMMISSIONERS MTG - Their reaction to a Plea from Cirizens for space for the Common Law Grand Jury to meet. I believe that the Terry Trussell case is the biggest threat to their racketeering criminal scheme in the history of our Constitutional republican form since 1789! This is evidenced by the lawyer/attorney’s propaganda and their fear as to the outcome of the case. Just look on fog bow to see what I mean. Their ignorance really shines on that site. These people would sell their soul for a buck. Now is the time for us to act to save the common law to protect our freedom. Terry needs our financial support to defend this tyranny. It may be YOU, tomorrow if we do not win this issue. Please contribute to his defense. www.gofundme.com/justiceforterry.